The Coding and Payment Guide for Dental Services is your one-stop coding, billing, and documentation guide to submitting claims with greater precision and efficiency. 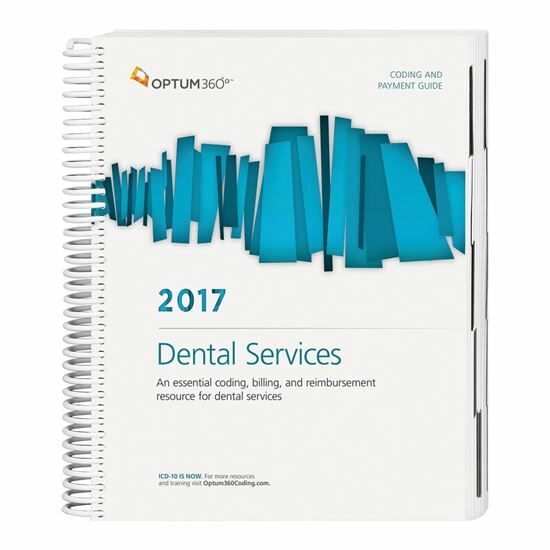 This guide has the latest 2017dental services CDT,CPT® and HCPCS procedure codes,ICD-10-CM and HCPCS Level IIcode sets along with Medicare payer information, CCI edits, helpful code descriptions, and clinical definitions. Optum360 Edge — HCPCS Procedure Codes. Only Optum360 offers HCPCS procedure codes specific to your specialty with the same information as we provide for CDT and CPT® codes. Optum360 Edge — Documentation and Reimbursement Tips. Find documentation and reimbursement information for procedures on the page for quick reference. Avoid confusion with easy-to-understand descriptions. Includes clear explanations of procedures represented by CDT, CPT® and HCPCS procedure codes, along with clinical definitions and ICD-10- CM code explanations specific to dental services. Prevent claim denials and stay up-to-date with Medicare payer information. Review Medicare Pub. 100 references containing information linked to HCPCS Level II and CPT® codes tailored to dental services, to prepare cleaner claims before submission. Improve the precision of ICD-10-CM code selection. Prevent claim denials often caused by incorrect code selection with icons that help identify the most appropriate ICD-10-CM code. Easily determine fees for your practice and reinforce consistency in the charges. National Medicare relative value units for surgery codes and most diagnostic procedures are included. CCI Edits by CPT®· and HCPCS procedure code. CPT® and HCPCS procedure codes with associated CCI edits in a special section and quarterly updates available online.